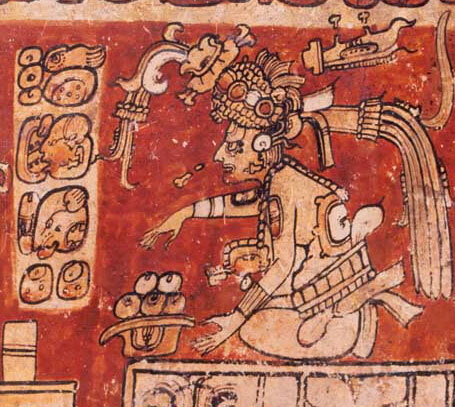 One of the most important gods, Itzamná is a creator god, associated with writing and divination. Lord of the Heavens and Earth, and associated with creation and birth, he was credited with the invention of writing and ‘books’, and is often portrayed painting or as a scribe. 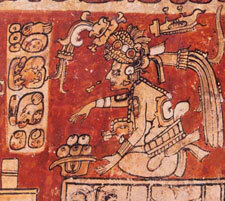 His counterpart is the old goddess Ix Chel. Also known as God D, he is always shown as an old man, with a large square eye and a hooked nose. He shares some attributes with the Sun God. In the codices he appears repeatedly with the Malze God or seated on a throne, facing other deities, such as God N or God L.
The sign Akbal (meaning night and darkness) usually appears on his headdress and in his name glyph. This sign represents a mirror, a device used in divination. A mirror always features in shape of a beaded disc that sits prominently on his brow (can you spot this disc in pictures 1 & 2...?) Itzamná was a wise god, with esoteric [rarified, specialist] knowledge, and he was believed to have the power of healing. He was therefore invoked as a god of medicine. • Pic 2: Image from Wikipedia (Itzamná).